Average Weight	: 18 - 22 lbs. Photo Courtesy info : Scottie Kingdom Rescue, Inc. The Scottish Terrier, also known as the Aberdeen Terrier, is a strong and sturdy breed of little dog that is often called just the Scottie. He has a distinctive and unique shape and profile, which the dog is known for. These Terriers are one of five different breeds of terrier that came from Scotland, with the other four being Skye, Cairn, Dandie Dinmont and West Highland Whiter Terriers. George the fourth, the Earl of Dumbarton gave them the nickname, little diehard" in the 19th century because of their bravery and perseverance. The Scottish Terrier was developed in Scotland in the 1700s. The breed was first called the Aberdeen Terrier, after the Scottish town of Aberdeen. George, the fourth Earl of Dumbarton nicknamed the dogs "little diehard" in the 19th century. •	Brave, alert and feisty. •	Needs firm, gentle handling from early on or will dominate the household. •	Sensitive to correction, so be firm, gentle and confident and consistent. •	Will establish themselves as the leader of the household if allowed. •	A big dog in a small dog's body. •	Make good house pets. •	Can be moody, snappish, stubborn, protective and develop obsessive barking traits. •	Not great with small children. •	Moderate exercise will do for this noble breed. •	Good in apartment lifestyles. The Scottish Terrier loves to dig, and there is no fence they can't dig their way out of if they set their mind to it. They will need you to constantly discipline them for this, being firm but loving. Because of their breeding, they will chase other small animals if given the chance, so they should always be on the leash. The Scottish Terrier is such a popular dog that they have been owned by 2 different presidents of the United States. Franklin D. Roosevelt owned 2 different Scottish Terriers and George Bush also owned one. There is also a Monopoly token that was made after the Scottish Terrier and is everyone's favorite piece. 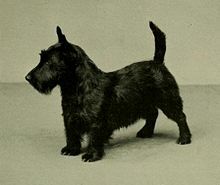 The Scottish Terrier was the famous dog 'Jock' in the Disney movie, Lady and the Tramp. In 2007, Carnegie Mellon University named the Scottish Terrier their official mascot. The Scottish Terrier is an alert and very lovable dog with enough charm to make everyone love them. As puppies, they are very playful and friendly. They are a very moody dog, however, that can be loving and playful one moment and crabby and snappy the next. They can also be very stubborn dogs that need a firm voice and hand from a young age or they will try to run the entire household as an adult. The Scottish Terrier is very sensitive to being corrected whether it's in training or just being disciplined. He definitely knows the difference between criticism and praise. This dog has a very gutsy attitude, and will try to challenge you if given the chance. He will try to challenge those that he feels are not "the boss" of the family. They are very loyal to their family and make excellent watchdogs. The Scottish Terriers do have a tendency to bond more with just one or two members of the family and are more loyal to them. They are a very sensitive dog very in tune with their master's moods. If their master is having a bad day, this sweet little dog will immediately pick up on that and act accordingly. They have very little interest in making friends with people that are not family members. In fact, they are quite reserved with strangers, preferring to not be bothered by them. a very playful dog , the Scottish Terrier loves to play ball, go for walks and just romp around indoors or outdoors. They are barkers and love to hear the sound of their voice. They are not a real good dog with small children, although they get along good with older children. They are sporty, playful dogs that have an independent streak and will respond better if led to believe that it's their idea to do something you want them to do. If you didn't see their small bodies, you would think of them as a big dog by their versatility and demure. As with most small dogs, they are occasionally called "ankle biters", but they still make wonderful household pets that can be taken anywhere you go. The Scottish Terrier has a long shaggy coat that requires regular brushing to prevent knots from forming and to remove dead hair. Grooming of the hair should be done every 6-8 weeks to maintain their characteristic look and shape. They will need haircuts or trimming at least twice a year. These dogs can be clippered or hand stripped depending on if they are a dog used for show or family pet. Hand stripping is a method of grooming where the hair is pulled out instead of cut. As it grows back, their outer coat will have a very wiry texture and feel to it. This method of grooming is necessary when the Scottish Terrier is to be shown in the show ring. If you do not show your Scottish Terrier, it is better to just clip him. Not only is this easier as you can do it yourself, but it is also less expensive. When the dog is clipped, his hair has a soft velvety touch when the long wiry stiff ends are cut off. You will be clipping his body, giving extra attention to his feet, legs and ears. Your Scottish Terrier can be given a bath when needed. Some breeders recommend dry shampoo when bathing them while others use a gentle dog shampoo and conditioner. After his bath you can blow dry his hair or let him outdoors if the weather is nice. Air-drying is much better for their skin and hair than blow-drying. I hope that your Scottie has been getting this kind of attention since he was a puppy so he's used to it and loves the bonding time. When you first get a Scottie puppy, it is important to touch his feet and ears often to let them realize that this something that can get used to and not fear. Generally, Scotties don't like having their feet touched, but if they are accustomed to having it done, they will take to it much better. The nails need to be clipped regularly and cleaned. It is very important to keep the eyes and ears clean and dry. If you are uncertain as to how to properly groom and care for your Scottish Terrier's hygiene, there are sites online that give directions or you can take him to a professional groomer. The Scottish Terrier needs exercise just like every dog but due to their small size, much of their exercise and romping around takes place indoors. There are many indoor activities this small dog enjoys such as playing catch and hide and seek. They love going for walks outdoors. They enjoy cooler temperatures so enjoy spending time outside unless it's hot. They do need to be kept on a leash at all times so they don't chase animals. This is extremely important if you live in the city where they can run out in the street and get hit by a car. Because of their great digging ability, if they are kept in a fenced yard, they should be watched carefully so they don't get out. Training the Scottish Terrier is something that needs to be started at a young age to enforce in them what is expected of them. Because they were originally bred to do work independent of their family, they are sometimes stubborn about learning what you want them to do-especially; if it's not something they want to do. The dog may be stubborn, but he still enjoys playing and needs proper motivation to want to learn. You may want to use treats or toys or simply praise. Find whatever works best and stick with it. The very first training your Scottish Terrier will receive is when you housebreak him. You will determine at that point, how eager and willing he is to learn new things. Always, praise a job well done and avoid negative enforcement, as they will get an attitude. They can be very stubborn when they want to be and need to think it's their idea. Basic Obedience training is something that you can teach them yourself if you have the time, or you can enroll them in a class. With the Scottish Terrier, consistency is very important. Walking them on a leash is a lesson that they should begin at a very young age as well. Because they love to chase little animals and are a great escape artist, they must never be off the leash when outdoors. The Scottish Terrier does very well in the show ring. If this is something that interests you, check with local groups in your area or search online for where competitions are held and what the procedure is.